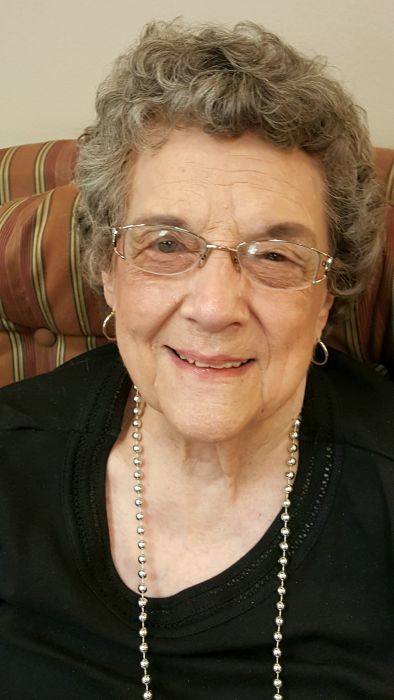 Barbara Jean Kleinpaste died Wednesday, April 10, 2019. She was 95 years old Memorial services will be held at 11:00 AM Wednesday, April 17, 2019 at the Hollandale Reformed Church. Reverend Neal Ooms will officiate. Visitation will be held one hour prior to the service at the church. Interment will be in the Hollandale Cemetery. Barbara Jean Hanson was born April 27, 1923 to Edward P. and S. Augusta Peterson Hanson. She graduated from Albert Lea High School. Allan B. Kleinpaste and Barbara Jean wed on July 3, 1942. After the war, they owned and operated Hollandale Hardware. She was an active member of the Hollandale Reformed church. Barbara Jean thoroughly enjoyed a good conversation. Always inquisitive, she was sincerely interested in the lives of others. What time was available after a kaffee klatsche or bridge club was spent reading books, primarily crime fiction. Barbara Jean is survived by her children Susan (David) Zuelke of Waconia, Steven Kleinpaste (Chris James) of Minneapolis, and Timothy (Doreen) Kleinpaste of Minneapolis. Grandchildren: Erin (Steven) Geske, Eric Zuelke, Drew (Nora) Kleinpaste Chet (Amanda) Kleinpaste, Madeline (Shalene) Kleinpaste, Nathan Kleinpaste. Step-grandchildren: Kaylen (Jeff) Jackson, Maggie James. Great-grandchildren: Tyler, Clarissa, & Lily Geske; Helen Kleinpaste, Ariyah Mae Kleinpaste, Conor & Kate Jackson. Sister-in-law Geraldine Hanson and many nieces, nephews and cousins. Barbara Jean was preceded in death by her parents, husband Allan, daughter Sally Ann, brother E. Luverne (Harriet) Hanson, brother Robert E. (Florence) Hanson, Brother John S. Hanson, sister Gretchen (Merlin) Nash and sister Phyllis (Harold) Benson.